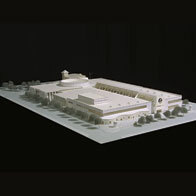 The selected design gives the library, which has one of the largest genealogy collections in the nation, an image that reflects its prominent role in the community and enhances the urban context. It will make a significant portion of the collection “browse-able” by expanding open stacks. There are two public entrances to the expanded facility. The existing re-imaged Webster Street entrance maintains the current easy pedestrian access from downtown and incorporates a Café and Library Shop to permit a synergy of uses. 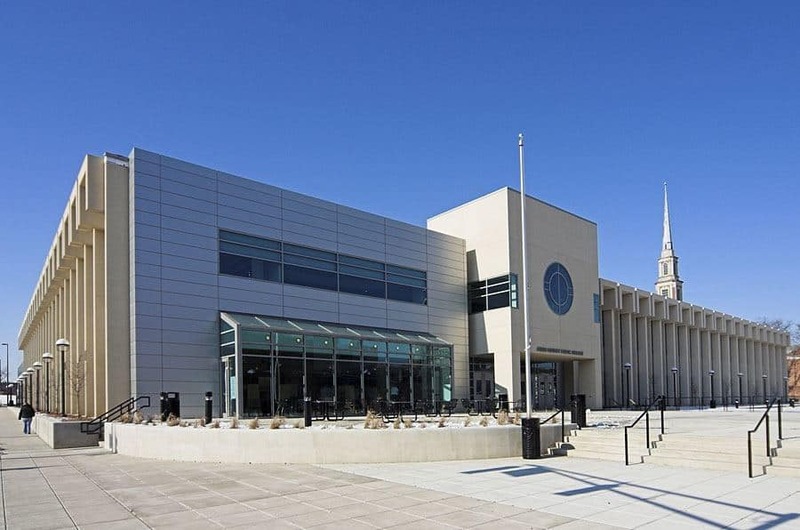 The new Ewing Street wrap-around entrance integrates the connection to the new below-grade parking and includes a major glass component that affords attractive views to neighborhood churches and the historic district. The east and west entrances are interconnected by the great hall, which provides clear visual orientation and access to all library departmental facilities and seamlessly integrates the existing renovated spaces and the new construction. The curved roof of the great hall contains a large north-facing skylight and a shaded south-facing clerestory window, bringing daylight into the center of the building. The great hall can be separated from the library spaces, so that community functions can extend past library hours if needed, without compromising library security. The central great hall also houses the Circulation Desk, Central Reference Desk, self-check stations, electronic catalog stations, and informational components, as well as stairs and elevators to the Library’s second level, the new Auditorium on a lower level, and the Garage below grade. Community use facilities are organized along the southern side of the first floor, between the great hall and Washington Blvd. These spaces include flexible Meeting Rooms, Access Fort Wayne Television, Community Computing and Public Computer Training, an Exhibition Gallery, the Café, and the Library Friend’s Store. Associate Architect: MSKTD & Associates, Inc.